The Arab League says Israel is “Judaizing” Jerusalem. Is that anti-Semitic? Is the Campaign Against “Judaization” Anti-Semitic? 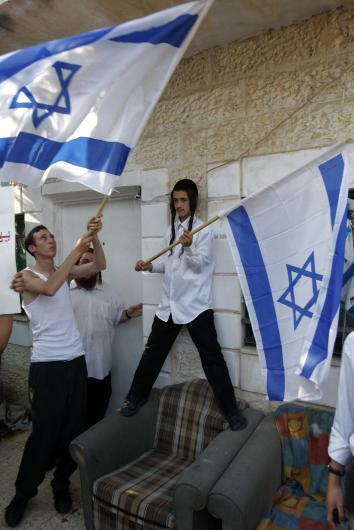 Jewish settlers wave their national flag outside a house belonging to a Palestinian family after they recently occupied it, in East Jerusalem, on July 8, 2011. The Israeli-Palestinian peace talks have blown up again. Palestinian President Mahmoud Abbas, unhappy with Israel’s failure to release Palestinian prisoners as part of the negotiations, has applied for membership in international agencies, circumventing the U.S. and Israel. Secretary of State John Kerry has responded by canceling his trip to the Middle East. Meanwhile, Israel is soliciting bids from contractors for more settlement construction in East Jerusalem. The peace process has blown up many times before. Each time, the U.S. backs up and tries to lower expectations, announcing a process that will lead to a process that will lead to a process that will lead to a deal. But the post-blowup spin game has changed. Abbas has turned to the United Nations, using his support among the member states to win acknowledgment of Palestinian statehood. And Israeli Prime Minister Benjamin Netanyahu has played the anti-Semitism card, attributing criticisms of Israel to hatred of Jews. attempts to boycott, divest and sanction Israel, the most threatened democracy on Earth, are simply the latest chapter in the long and dark history of anti-Semitism. Those who wear the BDS label should be treated exactly as we treat any anti-Semite or bigot. Netanyahu’s strategy—portraying objections to Israeli policy as attacks on Judaism—creates trouble for a term commonly used by critics of Israel. The term is “Judaization.” This term has a long history in Arab rhetoric. Egypt, Jordan, Qatar, Syria, Turkey, the Palestinian Authority, Hamas, and Israeli Arabs have all accused Israel of trying to “Judaize” territories and cities, particularly Jerusalem. The term has been applied not just to settlements, demolitions, and deportations, but also to archaeological excavations. Most Arab governments have used the word in a defensive context, protesting what they see as illegal, state-backed invasion of areas previously occupied by non-Jews. Peace activists critical of the Netanyahu government have used “Judaization” in the same breath as “apartheid” and “ethnic cleansing.” Haaretz, an Israeli newspaper, has editorialized against the government’s policy of “Judaizing the Galilee,” which the paper condemns as racist. Beginning with the first Zionist immigrants and continuing in into the present day, yihud [yi-HOOD], Judaization, is the term used to describe Israel’s official spatial policy. … Yihud has been an official policy of successive Israeli governments, which cite the need to ensure the country’s territorial integrity and also to redress the disparity in its population distribution … Moreover, some see Judaization as the earthly tool of achieving a divine promise—claiming the Land of Israel in its entirety for the People of Israel. In Arab countries, criticisms of Jewish claims and Judaization are wildly popular. In Israel, these criticisms convey hostility, but the threat they pose is tempered by the knowledge that Jews are the majority. In the U.S., however, the resonance is very different. Here, Jews have always been a minority, and Muslims are widely seen as a terrorist threat. Proclamations against Judaization, no matter what their basis in settlement or demolition activity, sound grimly anti-Semitic. That’s why Netanyahu accuses his critics of anti-Jewish bigotry when he comes to the U.S.—and why Palestinian and Arab leaders might want to change their language.